As women in Suriname, we believe that the Christian faith community can make a great contribution to the preservation of a living, healthy and safe environment. The future of the earth for the next generations matters to us. We see this as one of the key elements of the Christian faith. It reminds us of the relationship between God and creation, and God and humanity. Lies in northeastern part of South America. Named after Surinen tribe. Suriname is part of the Guianas, meaning “land of many waters”. 15% of land is coastal and less than two metres above sea level. At risk because of climate change and rising sea waters. Over 90% covered by pristine tropical rainforest. Humid tropical climate. Average temperature during the day is 27.1o C. January is the coldest month (averaging 26.1oC), and the hottest month is October (averaging 28.3oC). Country of beauty and high biodiversity. 715 species of birds, many orchids, over 60 species of lobster claw ower, the blue frog and the giant sea turtle. of the environment.15% of land surface protected territory. Largest nature reserve is on UNESCO’s list of Heritage Sites. 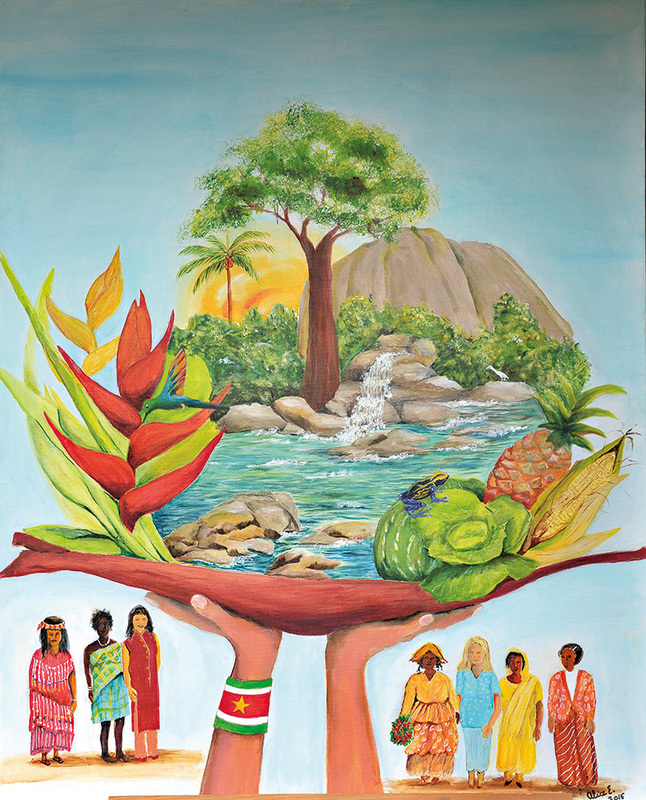 In March 1993, the Suriname government rati ed the United Nations Convention on the Elimination of all forms of Discrimination against Women. In 2015 there were 15 female MPs and the cabinet consisted of 3 women and 16 men. Although the interests of the child are protected by the government and UN, there are still violations of their rights. Agriculture and export of sh. Gold and crude oil are the greatest sources for foreign currency. Extraction of water from subterranean water sources, for global shortage. In 1995, World Bank classi ed Suriname as the seventeenth richest country in the world for its natural resources. Other health issues include: malaria, HIV/AIDS, dengue, chikungunya, zika, drug addiction and mercury poisoning.